So Newt (also known as Newton, Newtie, Newtie Pootie, Newtus Hamsterus and Custard's Victor) was born on 24th March 2017 and is one of Souffle's Halluperts litter. He came home with us on Saturday 6th May and enjoyed exploring his cage. We've ended up calling him Newtie when we talk to him. He is currently adjusting and settling in. 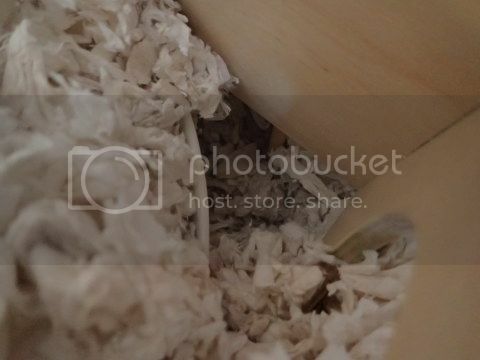 After exploring the cage he went into the house and started digging next to the potty and disappeared, kicking the Fitch out behind him. 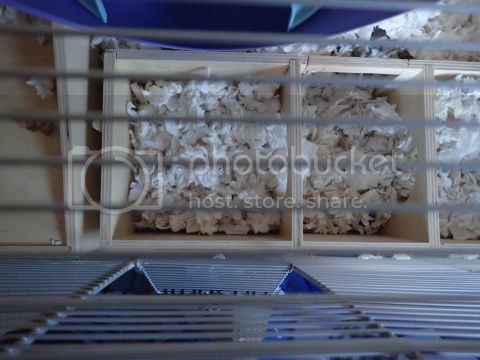 He went a bit headless chicken later on the first evening, climbing bars and running around a lot, then got scared by a noise and buried himself in a corner of the cage. 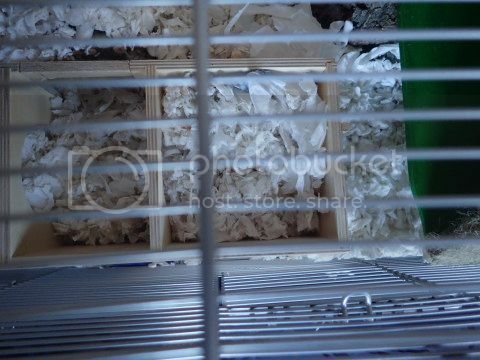 Normally I would leave him alone to settle in for 2 or 3 days but was advised to keep handling him a bit every day as he had been used to and he seemed to want to come out. He had a bit of time in the playpen with me and checked out the wheel a little bit. He is just using the wheel occasionally in the playpen at first until he's grown a bit. 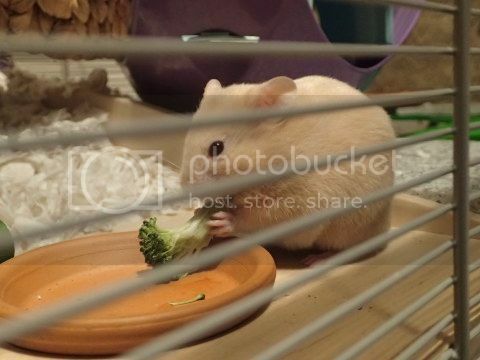 He then settled down in the cage, ate some broccoli and disappeared down the hole in the top of his house. Yesterday we waited patiently to see him. I put his food and veg out around 6.30pm with a bit of cage noise so he knew it was feeding time. And checked out where he might be nesting. Both rooms in his house were filled to the top with Fitch. A large tunnel going down under the house next to the potty, so no idea where he is nesting lol. He appeared in the hole at the top of the house sat and looked and listened to me for a few minutes then disappeared again. Later in the evening he was out and about in the cage, using his water bottle and seemed a bit calmer. He went a bit headless chicken again later on - lots of climbing and running around and wanted to come out again, so he went in the playpen again and sat for a stroke at one point, then had a bit of scrambled egg. 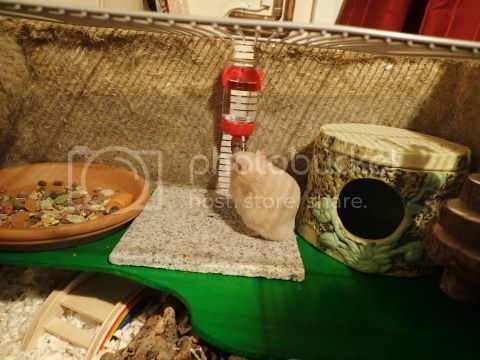 This morning he seems to have taken his water bottle out of its holder and somehow moved it down to the floor of the cage, on it's side on top of the rainbow bridge! Which is some distance away. Maybe he wants it there lol. I've put it back in the holder. He seems to like carrot, broccoli, cheese, egg, millet and a raisin, but ignored a piece of walnut left out. Last edited by Serendipity7000; 05-08-2017 at 01:32 AM. Really excited for this thread, I can tell Newt is going to be a little character. He is so gorgeous! 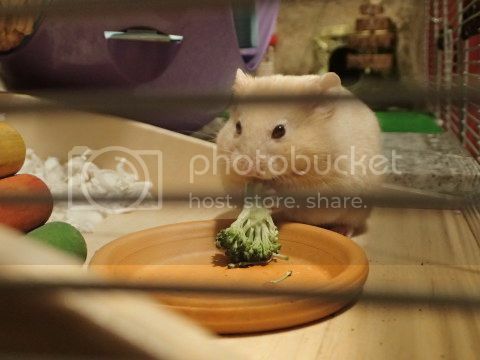 I love the pictures of im with his broccoli. I am quite jealous of you getting to stoke him How is he with being held? I imagine he is already completely tame, seeing as Souffle raised him. I think I have a bit too much Fitch in lol. Anyway it's done now - he seems to like it and it lowers the height from the roof. I tried doing the arm in the cage for him to walk up but it seems he has decided not to do that any more lol. Maybe it's because it's a different arm Or because the other hammies aren't there, so he's getting more independent. Yes it is lovely that he is used to people, and isn't scared of us and he relaxes a bit when stroked - he's too fast to hold for long right now I know how frustrating it can be to wait to hold them - it took us 2 months of bathtub taming before we could pick Charlie up! Stop it, or if you aren’t carefull someone* will come steal him! I'm glad to hear he is doing well. They are busy bees when they get going. 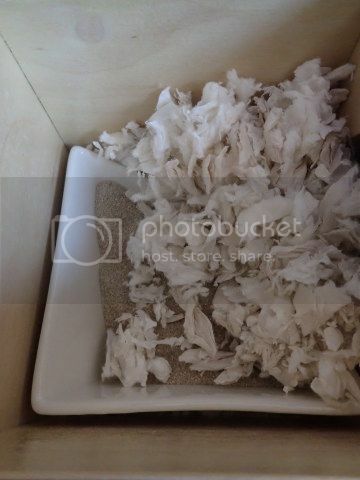 I was going to say I think he has too much substrate so is hiding more than you would really want him to. It may be an idea to remove and bag some up for later just so he doesn't bury himself all the time. Keep doing lots of the hand to hand running making your hands a little tunnel. Remember he is still a little toddler and they do like to have crazy half hours! 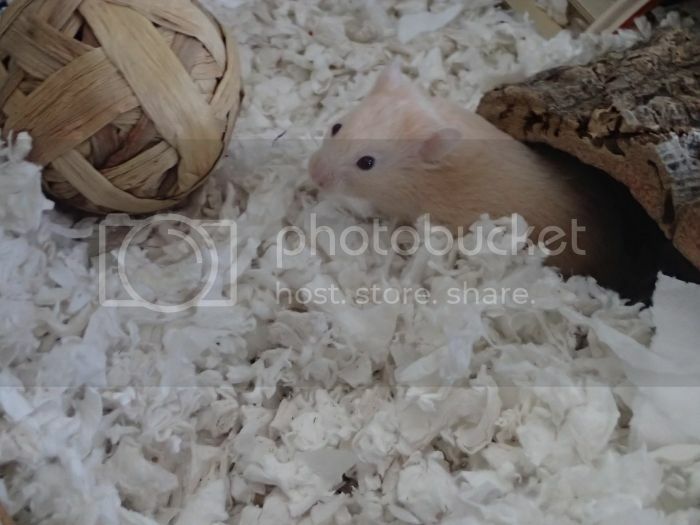 He won't be like an older settled hammie at the moment. Be very confident and just pick him up like I showed you. None of this litter have ever nipped and they have been handled from when their eyes were open at 15 days so they are used to it. His brothers and sisters all all doing very well too and I have updates and they are all coming out and being handled happily too Looking forward to lots of updates.